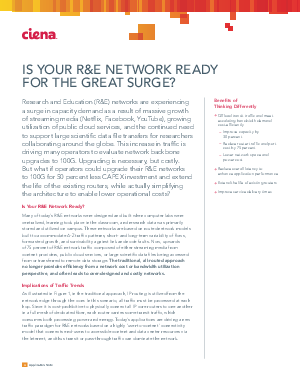 Offers > Ciena > Is Your R&E Network Ready for the Great Surge? Upwards of 75 percent of R&E network traffic composed of either streaming media from content providers, public cloud services, or large scientific data files being accessed from or transferred to remote data storage. The traditional, all-routed approach no longer provides efficiency from a network cost or bandwidth utilization perspective and often leads to over-designed and costly networks. But what if operators could upgrade their R&E networks to 100G for 50 percent less CAPEX investment and extend the life of the existing routers, while actually simplifying the architecture to enable lower operational costs? Download our app note to learn how.